Heat oven to 400°F. In medium bowl, stir Bisquick mix, 2 tablespoons granulated sugar, 1/2 cup whipping cream and the lemon peel until soft dough forms. Onto ungreased cookie sheet, drop dough by 15 rounded measuring tablespoonfuls. Brush dough with 2 teaspoons whipping cream; sprinkle with sparkling sugar. Bake 8 to 10 minutes or until light golden brown. Remove from cookie sheet to cooling rack. Cool completely, about 20 minutes. Meanwhile, in medium bowl, stir together strawberries, blueberries and 2 tablespoons granulated sugar. Let stand until ready to assemble. In chilled small bowl, beat 1 cup whipping cream, the powdered sugar and vanilla with electric mixer on high speed until soft peaks form. 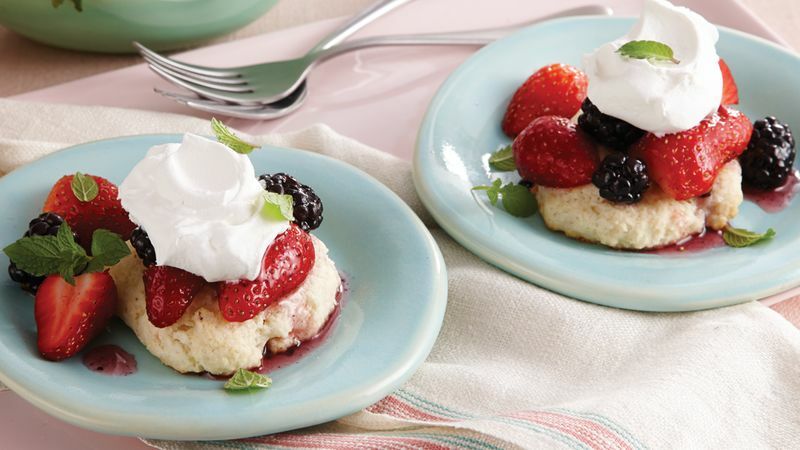 To serve, place each shortcake on dessert plate; top evenly with berry mixture and whipped cream. Garnish with mint.